Experience the adventure of snowmobiling through some of the most scenic backcountry in Western Canada! Drive your own skidoo or double up with a partner. No experience is necessary as our professional guides will show you the way! All our tours include the snowmobile, helmets, snowsuits (if necessary), safety orientation, and operating instructions. Some even include a lunch and evening dinner tours are available as well. Whistler activity discounts on Snowmobile Tours here... We guarantee the lowest Whistler snowmobile tour prices, so reserve online today and save your time and money. 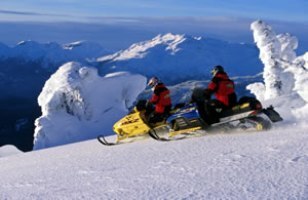 Follow this link for Whistler Snowmobile Tour discounts.